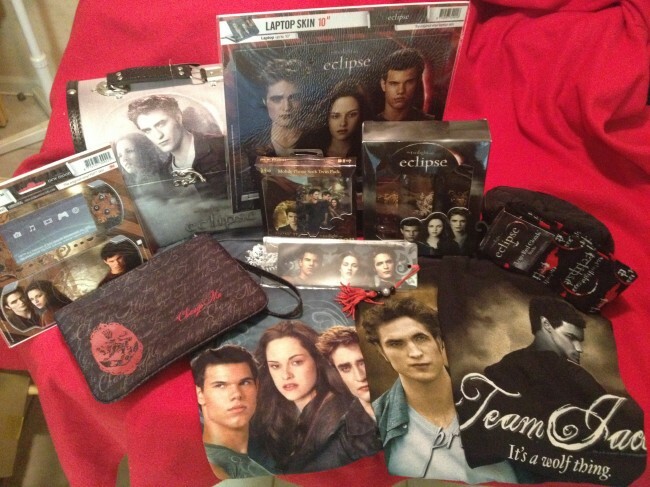 We are so excited for Rebecca, who won our 1st ‘Thankful for Twilight’ Give-A-Way! We will host our 2nd Give-A-Way tomorrow, November 3rd! Nov. 1 ~ Kallie & Stefanie: We are thankful that Breaking Dawn is TWO movies…We can’t even imagine what it would be like to have it all end in a matter of weeks! Are you happy the book was split into two parts for the movie? Why? Kallie~ Yes! We would have missed too much otherwise! Kassie~Absolutely, you could have made it 4! Stefanie~Um, I believe the answer you’re looking for is “Duh!” Breaking Dawn as one movie would not cover near enough material to satisfy any Twilight fan. Two movies, FTW! Krystal~Of course! The more Twilight footage we get, the better. You know they would have had to skip too much if it had only been one film. *To enter you must submit a comment below, answering the questions from above. The contest is open INTERNATIONALLY, and a winner will be selected at random. The contest will be open during the entire 24 hours of the day (November 1, 2011, Eastern Time). Once the winner is selected they will be emailed, and given 7 days to respond to the email. Yes because otherwise they would not have been able to cover important bits in the book and too much would have been cut out of the movie. Yes i am glad they split it in 2 movies because there is so so much that happens in Breaking Dawn, although i would love to see both movies at the same time 😉 I know it’s just a dream lol But seriously i just hope it doesn’t leave any blanks for the fans that haven’t read the books ( new fans of the saga). All Twi-Hards out there deserve atleast another year of anticipation. I’m so hoping it is as descriptive as the book and although i am a cullen fan i hope it includes the specifics on Jake’s feelings leading to the birth and after. I am so glad they made BD into 2 movies. My son is 7 and loves Twilight. He read the first graphic novel by himself. We watch the movies together all the time. Having BD come out in 2 movies allows me to enjoy that excitement with him a little while longer. We watch all the new trailers together when they come out and have date night at the movies for the premieres. Not only does BD coming out in 2 parts allow me to get lost in the Bella/Edward world, it brings my son and I a little closer a little longer. I am very happy that Break Dawning was broken down into 2 parts..I think if i would of been one movie it would of been way too long and they probably would of had to cut out a lot …Also another reason I’m happy that Breaking Dawn was split into 2 movies is I can be Twilight crazy for a bit longer..This year Breaking Dawn part 1 comes out 4 days before my birthday and i was giving 2 advance screening tickets for my birthday..Breaking Dawn part 2 is coming out 6 days before my birthday next year..So looking forward to it!